The Pahrump Valley High track team will be sending four athletes to the state meet this week, which starts on Friday and ends on Saturday in Reno at Bishop Manogue High School. 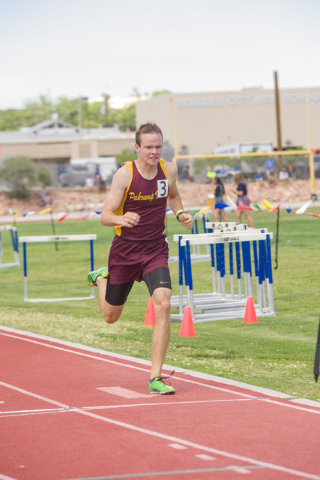 Sophomore Bryce Odegard will be going to state as the regional champion in the 800-meter run as he ran 1 minute and 58.73 seconds at the regional meet at Boulder City on Friday and Saturday. He was the only regional champion for both teams. The boys team finished fourth out of 16 teams (60 points) at the regional meet and the girls finished 11th out of 15 teams (12.5). Odegard will be running in the 800, 1,600 (4:44.02) third place, 3,200 (10:42.20) fourth place. Junior Dylan Montgomery made it in the 110-meter hurdles (16.39) fourth place and the 300 hurdles (41.58) third place. Jeremy Albertson threw himself into the state meet by throwing 152-06, which was enough for second place. The fourth athlete was senior Meghan McDermott, who took second in the 100-meter hurdles (16.54).